Situated in south-western Africa on the Atlantic seaboard and bisected by the Tropic of Capricorn, Namibia with its surface area of 824 268 square kilometres is a vast country, even by African standards. Bordered in the west by the Atlantic Ocean, in the north by Angola and Zambia, in the south by South Africa and in the east by Botswana, the country can be divided into four separate topographical regions. 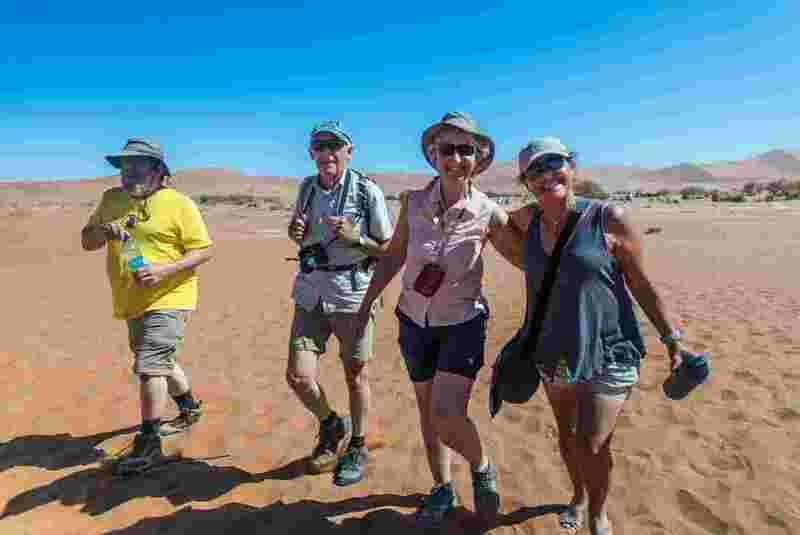 The most distinctive of these, the Namib Desert, is a long narrow strip of moist coastal desert between 50–140 kilometres in width and 1 350 kilometres in length, bordered by the Kunene River in the north and the Orange River in the south. Also running from north to south is the central plateau with an average altitude of between 1 000–2 000 metres and ranging from rugged mountain ranges interspersed with endless valleys and sandy plains. The plateau falls away to the east to merge with the legendary Kalahari Desert, typified by long, vegetated dunes of deep, red sand. In the far north-east are the high rainfall areas of Kavango and Caprivi, characterised by perennial rivers, tropical forests and woodland savannahs. Namibia’s climate, too, is one of contrasts, with regular droughts and periods of intense water scarcity, which occur cyclically, as in any semi-desert country. 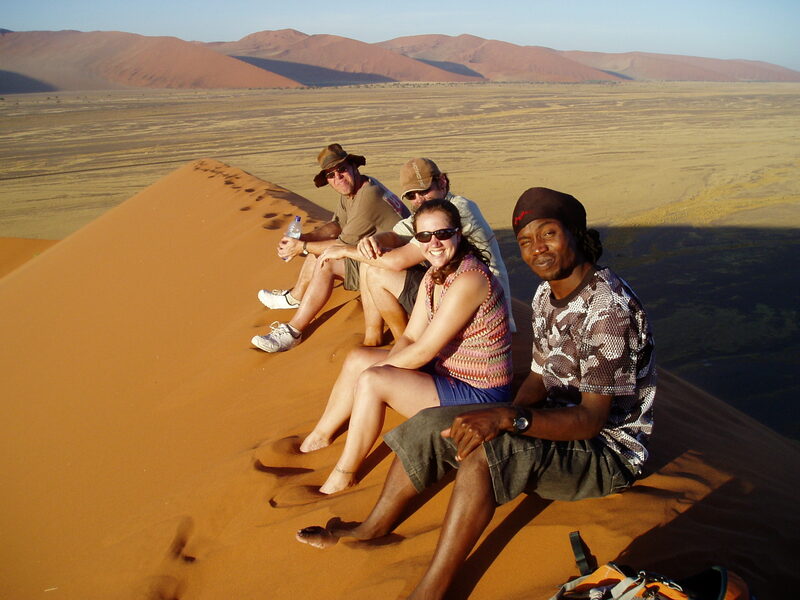 It is primarily these topographical and climatic features that have shaped the history of Namibia and its people. The historian Herodotus wrote that the Phoenicians were the first seafarers to sail down Namibia’s coast on their quest to circumnavigate the continent of Africa. This was 2 000 years before attempts were made by Portuguese navigators to find a sea route around Africa. The first was Diego Cão, who planted his stone cross or padrão at Cape Cross in 1486, some 150 kilometres north of Swakopmund. The second padrão was planted by Bartolomeu Dias in 1488 at Dias Point in the bay of Angra Pequena, or Little Bay, laying the foundation for the Lüderitz of today. The first white man to reach Namibia overland was the Afrikaner Jacobus Coetsé, who crossed the Orange River in 1760 to reach what was then called Transgarieb, the Garieb being the Orange. The first missionaries established mission stations at Warmbad and Blydeverdacht in 1805. Thomas Baines described his travels through Damaraland and Kaokoland in his book Explorations in South West Africa, published in 1864, while the Swedish adventurer and explorer, Charles John Andersson, who travelled through Namibia in the mid-1800s, was reputedly the first to refer to the territory as South West Africa. When flying over Namibia, the imprints of the geological forces that moulded and shaped the landscape are especially evident. About 600 million years ago notable rock forms accumulated, the remains of which consolidated, transformed and eroded. Today their remains, as the Damara system in the north and the Nama system in the south – blanket much of the land. Other sedimentary formations such as the Karoo and Kalahari systems subsequently added to the landscape. Prior to the onset of continental drift, Namibia lay landlocked in the hinterland of the gigantic supercontinent, Gondwanaland. As the continental plates drifted across the mantel of the earth they entered new latitudes and were metamorphosed by different climatic forces. In periods of prolonged cold, massive sheets of ice built up and planed vast sections of the countryside. At other times what is Namibia today lay submerged under primeval oceans that laid down extensive layers of sedimentary deposits as the foundations of today’s mountains. Some 120 million years ago when Gondwanaland began to drift apart and the African and South American continents came into being, Namibia acquired its western border in the shape of the Atlantic Ocean and its defining characteristic, the Namib Desert – the feature from which the country derived its name. The earliest known inhabitants of Namibia’s southern and central areas were the San/Bushmen, who were hunter-gatherers; the Nama, who were nomadic cattle farmers; and the Damara, about whose origin little is known other than that they were hunters and to a lesser extent pastoralists. The relatively stable water supply and well-wooded terrain in the northern and north-eastern regions encouraged cattle-farming and agricultural practices by the Owambo, who moved down from the Great Lakes of East Africa to settle between the Kunene and Okavango rivers in about 1550, and by the Caprivians, Tswana and Kavango, who moved to the water-rich north-east in the 1700s and 1800s. The Herero, believed to have lived in ancient times in the legendary African marshland of Roruu, moved southwards from the Great Lakes of East Africa and crossed the Kunene River into Kaokoland in the mid-1550s. Here they stayed for about 200 years, then moved further southwards to settle in the central and eastern regions of the country, leaving the Himba and Tjimba tribes behind in Kaokoland. The German Chancellor Prince Otto von Bismarck proclaimed Namibia (excluding the Walvis Bay enclave, which was under British occupation) as a German protectorate in 1884. In 1915 the peace of Khorab was concluded on the farm Khorab near Otavi, following the defeat of the German forces by the South African forces. Thus the South African forces were now in control of German South West Africa, and in 1920, in accordance with the Treaty of Versailles, the League of Nations confirmed South Africa’s mandate over Namibia. The League of Nations dissolved in 1946, to be replaced by the United Nations (UN). In 1950 the World Court pronounced its first advisory opinion on the legal status of Namibia, namely that South Africa was still to take care of the interests of the inhabitants of the country under UN supervision. The Odendaal Commission of 1964, the implementation of which involved establishing different ‘homelands’ for Namibia’s indigenous population groups, had far-reaching effects on the social, cultural, economic and political future of the country. A protracted war between the occupying South African forces and the Swapo (South West African People’s Organisation) liberation movement started in 1966. The next year saw the institution of the Council for South West Africa, subsequently the Council for Namibia, and in 1970, in accordance with Resolution 284, for the first time, the Security Council asked the International Court for a consultative opinion on the legal consequences of the continued South African presence in Namibia, which was found illegal in 1971. The implementation of United Nations Resolution 435 for free and fair elections in 1989 resulted in Swapo coming to power. Thus, after 106 years of colonial rule, on 21 March 1990, Namibia achieved independence. Swapo co-founder and leader Sam Nujoma was instated as Namibia’s first president. Fifteen years and three terms later – the first as incoming, the subsequent two as elected president – Nujoma stepped down, to be succeeded by Hifikepunye Pohamba, former Minister of Lands, Resettlement and Rehabilitation.